Mexico economy seen slowing heading into the second half. Blame the U.S. on this one. For a growing number of portfolio investors, Brazil has been replaced by Mexico. Petrobras Is Worst Big Oil Investment on Deepwater Disappointments: Energy Petroleo Brasileiro SA is the worst investment among the world’s biggest oil companies this year as Brazil’s state-controlled producer suffers delays and cost overruns developing the largest oil finds in more than a decade. Mexico’s Slim family (Grupo Carso) takes stake in Argentina YPF nationalized enegy company Mexican tycoon Carlos Slim and his family have taken a stake in Argentina’s recently renationalized energy company YPF in lieu of a loan guarantee, .. 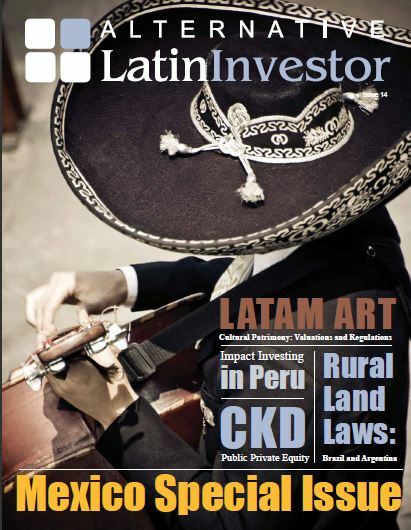 The Alternative Latin Investor Issue #14 is focusing on Investing in Mexico. Below some of the other content of issue #14. LAWEA pronounces 2012 ‘The Year of Wind,’ we explain how investors can publicly trade private equity in Mexico, as well as an in-depth update of foreign land regulation in Brazil and Argentina. 6. Alternative Energy In laboratories and workshops unnoticed by mainstream analysts, scientific visionaries and entrepreneurs are forging a new physics incorporating principles once thought impossible, working to create devices that liberate more energy than they consume. What are they, and how long will it be before they can be brought to market? Shrewd investors will ignore the “can’t be done” skepticism, and examine the newly emerging energy trend opportunities that will come of age in 2011…. 7. Journalism 2.0 Though the trend has been in the making since the dawn of the Internet Revolution, 2011 will mark the year that new methods of news and information distribution will render the 20th century model obsolete. With its unparalleled reach across borders and language barriers, “Journalism 2.0” has the potential to influence and educate citizens in a way that governments and corporate media moguls would never permit. Of the hundreds of trends we have forecast over three decades, few have the possibility of such far-reaching effects…. 8. Cyberwars Just a decade ago, when the digital age was blooming and hackers were looked upon as annoying geeks, we forecast that the intrinsic fragility of the Internet and the vulnerability of the data it carried made it ripe for cyber-crime and cyber-warfare to flourish. In 2010, every major government acknowledged that Cyberwar was a clear and present danger and, in fact, had already begun. The demonstrable effects of Cyberwar and its companion, Cybercrime, are already significant – and will come of age in 2011. Equally disruptive will be the harsh measures taken by global governments to control free access to the web, identify its users, and literally shut down computers that it considers a threat to national security…. 9. Youth of the World Unite University degrees in hand yet out of work, in debt and with no prospects on the horizon, feeling betrayed and angry, forced to live back at home, young adults and 20-somethings are mad as hell, and they’re not going to take it anymore. Filled with vigor, rife with passion, but not mature enough to control their impulses, the confrontations they engage in will often escalate disproportionately. Government efforts to exert control and return the youth to quiet complacency will be ham-fisted and ineffectual. The Revolution will be televised … blogged, YouTubed, Twittered and…. 10. End of The World! The closer we get to 2012, the louder the calls will be that the “End is Near!” There have always been sects, at any time in history, that saw signs and portents proving the end of the world was imminent. But 2012 seems to hold a special meaning across a wide segment of “End-time” believers. Among the Armageddonites, the actual end of the world and annihilation of the Earth in 2012 is a matter of certainty. Even the rational and informed that carefully follow the news of never-ending global crises, may sometimes feel the world is in a perilous state. Both streams of thought are leading many to reevaluate their chances for personal survival, be it in heaven or on earth…. Finding and Entrance into Mexico’s Affordable Housing Construction Finance Market. Increasing Threat of Currency “WAR’s” to Ignite 4th Quarter FX Activity?